How to ask the right question? Talk to your heart in a better way? I’ve bought this book, like 2 years ago, what Anthony Robbins writes inside never fails to impress me. Reading Chapter 8 moments earlier has broaden my perspective and would like to share here with you. Many often we are not satisfied on current life, feel unhappy, emotionally unstable and having relationships problems; have you ever thought this is because we ask the wrong questions? If we want to change the quality of our lives, we should change our habitual questions. We need to realize, what we do mostly day in and day out, is ask and answer questions. Remember, ask and you shall receive. If you ask a terrible question, you’ll get a terrible answer. But if you try to ask, “How can I succeed?”, “What I can do to succeed?”; the outcome will be totally different. Questions determine everything you do in life, from your abilities to your relationships to your income. Same goes to persons who ain’t doing well financially. They ask questions like “What toys do I want right now? instead of “What plan do I need in order to achieve my ultimate financial goal? The questions you ask will determine where you focus, how you think, how you feel, and what you do. And we can actually change how we feel in an instant, just by changing our focus! Stop asking “How come I’m so depressed?” or “Why doesn’t anybody like me?” as you will focus on and look for references to back up the idea that there is a reason to feel unloved or sad. Try something like this, ask yourself “What are my most happy memories?” or “What’s really great in my life right now?”. You’ll not only feel better but be able to contribute more to those around you! It’s because you’re deleting all the reasons you could be feeling good. And if you’re feeling good, you’re deleting all the bad things you could be focusing on! So, start asking empowering question to yourself right now. 1. What am I happy in my life now? 2. What am I excited in my life now? 3. What am I proud in my life now? 4. What am I grateful in my life now? 5. What am I enjoying most in my life now? 6. What am I committed to in my life right now? 7. Who I love? Who loves me? 1. What have I given today? Yes I’m a big fan of Robert Kiyosaki, the author of <Rich Dad Poor Dad>. His writing is always straight to the point and makes sense. Everyone is talking about financial freedom, but the imperative question is, how to reach there? 1. Never say you cannot afford something. That is a poor man’s attitude. Ask HOW to afford it. 2. Find out where you are at, where you are going and build a plan to get there. 3. If you want to go somewhere, it is best to find someone who has already been there. 4. Education is cheap; experience is expensive. 5. 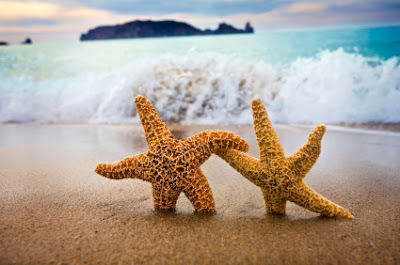 When going into business don’t just find great partners, BE a great partner. 6. When people are lame, they love to blame. 7. The hardest part of change is going through the unknown. 8. The only difference between a rich person and poor person is how they use their time. 9. Face your fears and doubts, and new worlds will open to you. 10. Your future is created by what you do today, not tomorrow. Also, I believe knowing is not enough, we need ACTION. So, Screw It, Let’s Do It! Traveled more than 750km during the trip… and it makes me feel like… oh natural is so wonderful! Malaysia is soooo blessed! “People live on trees in Sarawak”? 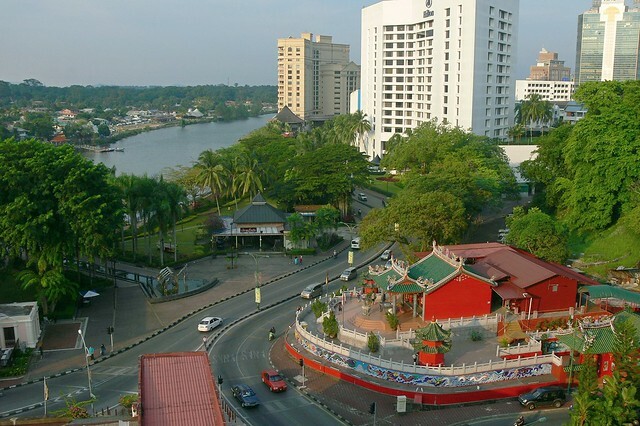 C’ mon, see its modern city of Kuching! It’s even more advanced than some cities in West Malaysia. It’s the best way to learn about Sarawak in 3 hours. It’s a real-life showcase of the Sarawak long houses and rich cultures. Don’t tell me you’re Malay, Chinese, Indian first and Malaysian second; when there’re more races like Iban, Bidayuh, Orang Ulu, Melanau just in Sarawak. Take a 5-min walk up to a resort at Damai Beach. The sea breeze is refreshing! Say Hi to South China Sea! Take a 15 min boat to Bako! Beautiful natural wonders at Bako. YMCA! It stands for… You Might Catch AIDS… Haha! HIV/AIDS awareness yo! BBQ with bearded pig (山猪) at night! It just keep staring at the foods… At a point of time 5 bearded pigs gathered in front of our chalet! Oh goodness! Good thing never come easy. You have to go through a lot of obstacles, sweat a lot and take the risk for not being able to catch the beautiful blooming moment. We’re just too lucky! Finally after 1 hour ascending Gunung Gading, we found it! This Orang Utan is called “Delima” – Delima got a ‘child’ called “Annuar“. Given the name during the 1998 Anwar’s Courtcase. Oh these Orang Utan are so smart wei! A lot of foreign tourists from all around the world are here @ 9 am. 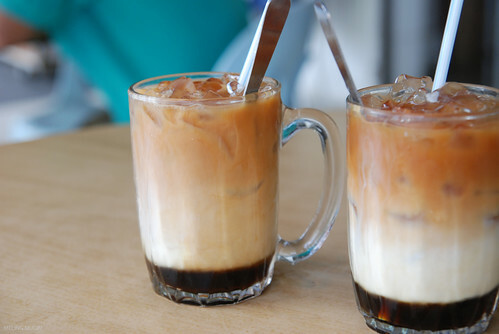 I don’t know why 3 layers Teh in West Malaysia just can’t be as good as the original one in Kuching. 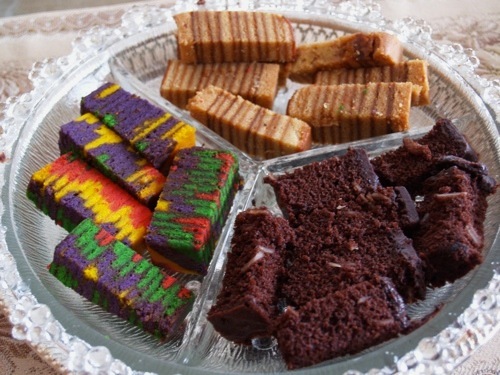 Kek Lapis Dayang Salhah – The best of the best in Kuching! You can try it for free… as much as you like It tastes better and very much more cheaper than the bakery shop! Prime location in the city center. 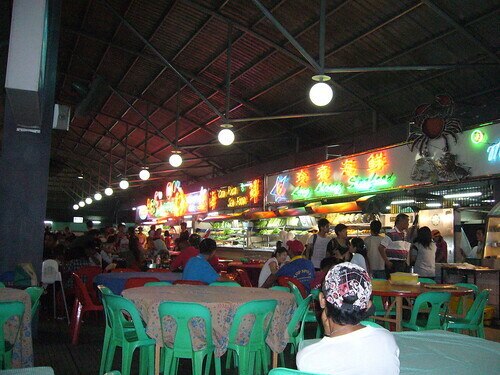 There’re at least 6 seafood restaurants on top of this car park building… unique hor? Haha, good seafood and don’t be surprised to see Malay friends having seafood here too! Want to see the real 1 Malaysia? Come to East Malaysia! A normal restaurant but the foods inside are just… awesome! Varieties of You Char Kuey for you to choose! It’s very crispy and not that oily. I like it! Sometimes when you walk, you can feel the charm of city even more. 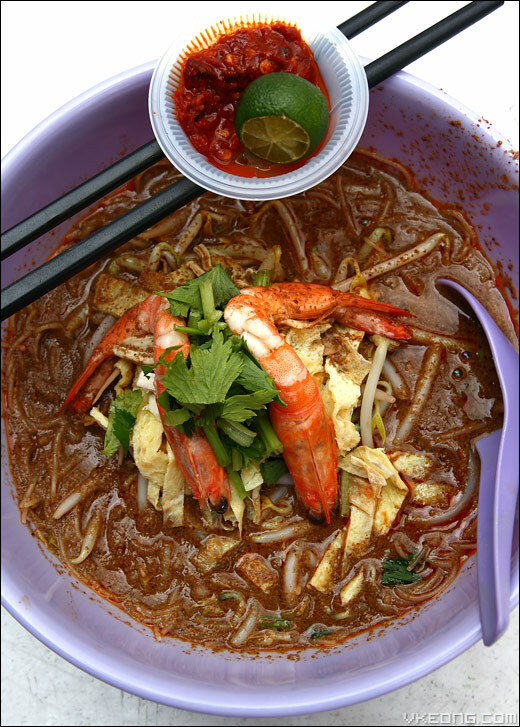 Start walking from Riverfront… Visit the Chinese Museum (Must Visit), buy black pepper at Main Bazaar (Pick the right shop), walk around at Attap Street (Chinatown) and Little India! 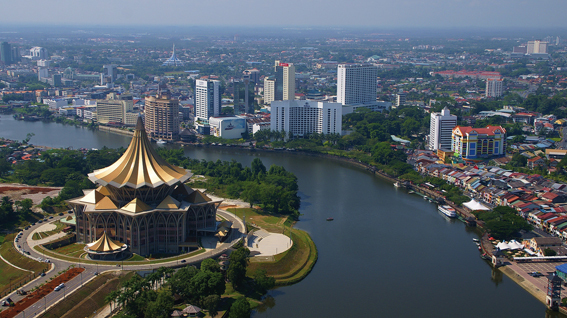 Kuching, a peaceful modern town with lots of nice foods, natural wonders and… its warm and friendly people! Why go travel so far to foreign country when East Malaysia has so much to offer? At the mean time… checking out for AirAsia promotion! How much was my flight ticket to Kuching ya……? It’s just RM 46! Like you so much Uncle Tony!